Porcelain vs Ceramic Tile -- Which Is for You? Do you think that porcelain and ceramic tile are essentially the same? You may be surprised to find that, though both are manufactured of similar ingredients using similar processes, there are some important differences. Familiarize yourself with the characteristics of both these tile types so you can choose the kind that offers the right price, durability, and good looks for your tiling project. The difference is in the details. 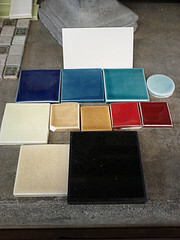 Ceramic tile is manufactured from red or white clay mixed with water and minerals, then baked in a type of kiln. It is nearly always finished with a glaze to reduce its natural porosity. Porcelain tile is made from light-colored clays with a fine grain (this gives it a dense body), quartz, feldspar, and a minimal amount of water, is pressed or extruded before being fired at substantially higher temperatures than regular ceramic. It is sold in both glazed and unglazed versions. The Porcelain Tile Certification Agency (PTCA) will certify tile as true porcelain only if it passes their rigorous testing.